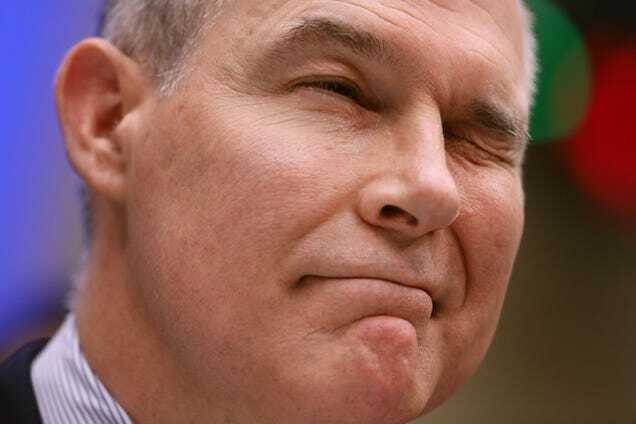 Environmental Protection Agency Administrator Scott Pruitt winks while testifying before the House Energy and Commerce Committee’s Environment Subcommittee on Capitol Hill in Washington, D.C., on April 26, 2018. Environmental Protection Agency head Scott Pruitt is becoming the Kanye West of Donald Trump’s Cabinet, and that’s because he can’t keep his name out of the press. Currently, Pruitt is facing at least 11 federal investigations into his lavish spending and possible kickbacks, including a sweetheart deal that allowed him the use of a Capitol Hill condo for a mere $50 a night—0h, and the condo just happens to be owned by the wife of an energy lobbyist. Then there is the money that he’s spent on security and lavish office furnishings, not to mention the sidestepping of government approval to get raises for his staff. Now it looks as if a $100,000 trip to Morocco last year that turned out to be twice the initial planned budget was planned by a lobbyist friend. The EPA claims that Smotkin attended a few meetings with Pruitt but tried to downplay his role on the trip. The bigger question isn’t whether Smotkin was involved—which, according to the EPA, he was—but why. Why is someone outside the government arranging meetings for a Cabinet official with outside interests? Why is Smotkin there in the first place? Smotkin is looking and sounding like 1990s Puff Daddy, where he can’t just stay behind the boards and produce; he’s got to be “all in the videos” [Suge Knight voice]. Meanwhile, Pruitt is out here buying Moroccan gold rings for every one of his fingers and walking through the White House like Trinidad James. Below is video footage of Pruitt stuntin’ on ’em after returning from Morocco.